While Yiddish is not likely to regain its former status as one of the most widely spoken languages in Israel, it is heard in a surprising variety of places today, from university libraries to the Tel Aviv Central Bus Station. Yiddish or – as many of its speakers called it – Jewish hasn’t had an easy time in the Jewish state. In the 1950s, when the horrors of the Holocaust were still too fresh to be voiced by many, the mother tongue of a significant portion of the population wasn’t merely unpopular in Israel. It actually was illegal for Israeli citizens to perform in plays or publish daily newspapers in Yiddish. Times have changed and though there are no longer enough Yiddish speakers in Israel to support a daily newspaper in the mamaloshen, last year the award-winning Yiddishpiel Theater attracted over 80,000 people to its performances all over the country. “Yiddish is like the lamp in the Temple that kept on burning even though there was only a small amount of oil,” YUNG YiDDiSH Founder and Director Mendy Cahan said in an interview before Hanukka. Many Yiddish speakers accuse Israel’s first prime minister, David Ben-Gurion, of continuing Hitler’s work by destroying Yiddish culture in Israel. Dr. Eyal Gertmann, an expert on German history and the development of Israeli nationalism who teaches at the Hebrew University of Jerusalem and Sapir College, has a more analytical and less emotional take on it. In the 1940s and 1950s, it seemed that the best way to do this was by suppressing the defining aspects of the many different Jewish communities that had arrived in Israel over the past few decades and promoting new symbols that could unify them, from sports teams to the Hebrew language to Bible stories, Gertmann says. The result was legislation to promote the Hebrew language and protect it from competitors, particularly Yiddish, which was much more widely spoken than Hebrew at the time. In addition to laws against theater performances and media in other languages, diplomats, emissaries, and anyone else who represented the nation abroad had to Hebraize their names. Many Yiddish speakers weren’t willing to give up their language without a fight. “The Hebrew intellectuals were threatened by Yiddish, but people loved it and didn’t want to throw out their culture,” says Cahan, who established YUNG YiDDiSH in 1991 to promote and preserve Yiddish culture. Writer and publisher Mordechai Tsanin found a creative way to evade the law forbidding the publication of a daily newspaper in Yiddish. He operated two newspapers, both of which appeared three times a week on alternating days, relates Rahel Ramirez of Leyvik House, the Yiddish writers’ association in Tel Aviv. Tsanin is the association’s honorary chairman today. The theatergoers were equally tenacious, Cahan says. Posters advertising performances in Yiddish often listed the wrong time for the performance, while the correct time was spread by word of mouth. As a result, when a government inspector tried to close down a show, he would find an empty theater. The law didn’t forbid foreigners from performing in Yiddish and so theater troupes from abroad frequently appeared in Israel. Gertmann suggests that three of the key events that shaped modern Israeli culture had a particularly strong impact on Yiddish culture in Israel: the Kasztner episode; the Eichmann trial; and the rise of the Black Panthers. In the state’s early years, many Eastern European Jews were embarrassed to speak Yiddish in public due to the lack of public sympathy for Holocaust survivors. Israelis didn’t yet understand the enormity of what had happened and mistakenly blamed the refugees for being led like lambs to the slaughter instead of bravely fighting the Nazis. This lack of awareness and sympathy reached its height in the mid-1950s when Rudolf Kasztner was accused of collaborating with the Nazis, he explains. Kasztner was born in Transylvania in 1906. A journalist and lawyer, he became a leader in the Hungarian Zionist movement. Following the German occupation of Hungary, Kasztner was a key member of the Jewish committee that negotiated with the Nazis to release Jews in exchange for military supplies. The committee’s main negotiating partner was notorious Nazi official Adolf Eichmann. The agreements they reached saved the lives of some 2,000 Jews, and perhaps even more. After the war, Kasztner made aliya and became an influential member of Ben-Gurion’s party, holding a series of important positions. In 1953, Malkiel Gruenwald published a pamphlet that denounced Kasztner as a Nazi collaborator. Since Kasztner was a public official, the state sued Gruenwald for libel on Kasztner’s behalf. In June 1955, not only did the state lose the libel suit, but Judge Benjamin Halevi castigated Kasztner in his decision, writing that he had made a deal with the devil. The government’s decision to appeal led to a coalition crisis, but it persevered. In January 1958, the Supreme Court cleared Kasztner’s name. It was a pyrrhic victory since Kasztner had been assassinated on March 3, 1957, by Ze’ev Eckstein. This highly publicized episode scared Eastern European Jews who had arrived after the Holocaust, leading them to seal their lips even more tightly. Even today, some older Israelis are convinced that most of the survivors were kapos or collaborators during the Holocaust. In the wake of the Kasztner trial, it wasn’t acceptable to discuss the Holocaust, not only because the survivors wanted to forget the horror they had experienced, but also because Israeli society didn’t want to hear about it, Gertmann says. The situation began to change with the Eichmann trial, he continues. Israel captured Eichmann, who had been hiding in Argentina, in a bold, headline-grabbing operation and brought him to Israel for trial in 1960. The trial and his subsequent execution, on the night of May 31, 1962, was followed avidly around the globe. In Israel, the trial was broadcast daily on the radio and the Israeli public listened as survivors testified about their experiences. Poetically, the panel of three judges that found Eichmann guilty included Halevi. This was the first time people really spoke openly about the Holocaust in Israel, Gertmann notes, adding that after the Eichmann trial, survivors began to tell their stories and Israeli society became receptive and sympathetic. The stigma of speaking Yiddish slowly began to fade. Meanwhile, over the years, the public began to realize that mistakes were made in the 1950s. This growing sentiment turned into action in the 1970s, when Mizrahim (Jews from Middle Eastern countries) began to demand respect for their unique heritages and to form organizations – the best known of which is the Black Panthers – that fought for this. The Black Panthers cracked the collective image that Ben-Gurion had created, opening the door for Israel to replace the “melting pot” with the multicultural “tossed salad,” he explains. After that, it was only a matter of time until other communities reclaimed their heritage, which included Yiddish for many. In the 1990s, the Knesset passed the Yiddish and Ladino heritage law, which recognized the languages’ importance in Jewish culture and the need to preserve them. The law led to the creation of the National Authority for Yiddish Culture. While Yiddish is not likely to regain its former status in Israel, it is heard in a surprising variety of places today, from university libraries to the Tel Aviv Central Bus Station, and not just in ultra-Orthodox neighborhoods. Greer Fay Cashman, a reporter for the Jerusalem Post, said she was pleasantly surprised to find that many of the people over the age of 50 who immigrated to Israel from the former Soviet Union in recent years speak Yiddish. Despite the efforts to thwart it, Yiddish has become prevalent throughout Israeli culture, notes Shmuel Atzmon-Wirtzer, the founder and artistic director of Yiddishpiel Theater. He points out that a study by Dr. Nissan Netzer, of the Department of Hebrew and Semitic Languages at Bar-Ilan University, found that 630 of the approximately 2,600 slang terms in contemporary Hebrew were inspired by Yiddish. Today Tel Aviv is home to a number of Yiddish cultural centers, such as Leyvik House and Shalom Aleichem House. Named after Yiddish poet and playwright H. Leyvik, whose works include the play The Golem, Leyvik House is the headquarters of the Association of Yiddish Writers and Journalists in Israel. It hosts numerous activities designed to cater to a broad population and publishes books in Yiddish, Ramirez says. “Leyvik House is a cultural center and aims to increase knowledge of and appreciation for Yiddish in Tel Aviv. At the same time, as a cultural center, we want to serve our community so we host a variety of activities that aren’t always connected to Yiddish,” she says, noting recently this included lectures with the Hebrew writers’ association and a cultural event in Russian with the Ministry of Immigrant Absorption and the Tel Aviv municipality. Leyvik House’s volunteer chairman, Daniel Galay, is a pianist and composer and one of the most successful activities is the monthly Klezmer concert in its lovely, old-fashioned hall. In February, it added three new monthly series – jazz, classical music, and world music – and now hosts a concert every Saturday night. The friendly, informal atmosphere and the high quality of the music are attracting increasing numbers of music lovers of all ages and backgrounds. The lectures on Yiddish and other literature also attract a diverse crowd. At a recent lecture on Yiddish poetry, well-known Yiddish intellectuals and entertainers and a handful of young Israeli and American scholars gathered around a table in a meeting room filled with books and photographs of their authors. The discussion was mainly in Yiddish, though participants occasionally threw in a Hebrew phrase. World-famous mime Zwi Kanar, a Holocaust survivor who fought in the War of Independence, explained that since Yiddish is his mother tongue it is only natural that he participate in the Leyvik House activities. Not far from Leyvik House is a large Yiddish library, which also offers cultural activities. Though both places appear similar at first glance and seem to offer similar activities, they have completely different roots. The library is operated by Brith Haavoda-Arbeter Ring, the Israeli branch of the Bund, the Jewish socialist organization founded in Eastern Europe at the turn of the previous century, Brith Haavoda-Arbeter Ring Secretary Josef Fraind explains. “The Bund stands for the same thing today as it did in the 1920s – human rights for all in the place you live,” Fraind says. He explains that the Bund was labeled anti-Zionist because it believed in fighting for human rights in the place in which you were born or resided and rejected the seemingly fantastical utopian solution offered by Zionism. However, the flood of Jewish refugees that came to the Land of Israel after the Holocaust included supporters of the Bund. Like Fraind, who immigrated to Israel from Warsaw in 1952, for most this move was due more to circumstances beyond their control than to Zionism. He recalls that in the early years, the animosity against the Bund was so great that many of its supporters were scared to publicly voice their thoughts or even vote for the Bund when it fielded a list for the Knesset. Many of the people who frequent the library are unaware of or unconcerned with the Bund’s ideology, notes Anna Viener, who is responsible for the library. “I’m here for the language, not the ideology,” she adds. The library contains some religious books, fiction, and books on Zionism, but is dominated by books on socialism. Ironically, the library operated by a movement known for being ardently secular attracts more than a few religious readers since Yiddish is mainly spoken in religious circles in Israel today. “Many people today associate Yiddish with religious people, but they forget how cosmopolitan and avant-garde Yiddish could be,” Cahan says, adding that the almost 50,000 Yiddish books YUNG YiDDiSH has spent the past 15 years collecting reveal a rich, varied world. He notes that the books give him a glimpse of the readers’ minds and demonstrate that Yiddish was read by a very diverse audience. In addition to writing about Judaism, Yiddish authors addressed futurism, Dadaism, anarchism, and all of the other ideas floating around Europe in the early nineteenth century, he says, adding that many of the philosophy books he has collected seem very contemporary. Writing and reading in Yiddish is not a thing of the past – he estimates that 30 to 40 secular books and several hundred religious books are published in Yiddish in Israel each year for a worldwide audience of about a million Yiddish readers. 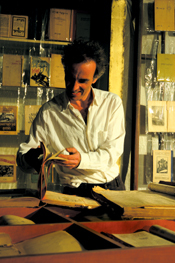 Cahan has found that while early Hebrew literature was very restrained and focused mainly on one topic – the Land of Israel – Yiddish literature written in Israel’s early years was varied. “As the minority language, the outsiders’ language, Yiddish had more sympathy for the types that there wasn’t room for in Hebrew literature – the luckless, clumsy characters. There’s more sympathy for the newcomers to the Land of Israel and the problems they face in Yiddish literature,” he suggests. 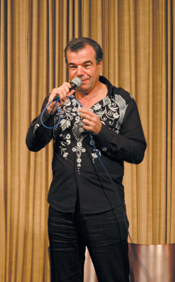 Cahan immigrated to Israel from Belgium, where he grew up speaking Yiddish. In addition to being an entertainer who has released a CD with his band the Yiddish Express, Cahan established YUNG YiDDiSH. The organization’s many initiatives include collecting, restoring, and cataloging books that would otherwise be discarded when Yiddish-speakers pass away and institutions with small libraries close. YUNG YiDDiSH operates a library in Jerusalem and is in the process of establishing a library in Tel Aviv. The facility in Jerusalem is much more than a library, Cahan notes, since it hosts cultural events, from concerts to literary discussions. He has similar hopes for the Tel Aviv branch. YUNG YiDDiSH’s new home in the Tel Aviv Central Bus Station consists of three large, connected halls that will make an ideal setting for such events, as well as for screening films and hosting art exhibits. In Jerusalem, YUNG YiDDiSH activities attract both the young and old, the religious and the secular. Cahan sees Yiddish as a bridge that can help overcome some of the gaps in Israeli society. He notes that the Yiddish summer program that Tel Aviv University offers in cooperation with YUNG YiDDiSH and Shalom Aleichem House attracted 100 bright, young students from Israel and abroad last summer. The Yiddishpiel Theater is attracting a similar audience – along with their parents, grandparents, and friends, according to Atzmon, who established Yiddishpiel in Tel Aviv almost 20 years ago. It has become one of Israel’s leading theaters and often performs in festivals abroad. In Israel, about a third of Yiddishpiel’s audience is young Israelis who heard Yiddish in their grandparents’ or parents’ homes and new immigrants who want to explore their Jewish roots. Though the plays are in Yiddish, simultaneous translation into Hebrew and Russian is available to make them more accessible to the younger audience members. The audience has been growing consistently over the years – in 2005, 84,923 people attended 329 performances. In addition, Yiddishpiel staged 135 special performances at old age homes around Israel, with the support of the Claims Conference. It also teamed up with the Education Ministry to produce a play for high-school pupils traveling to Poland. Nearly 10,000 pupils have seen the play. The 45-member theater includes artists of varying ages and launched an internship program two years ago to encourage young actors to work in Yiddish. Participants are selected based on their acting skills; most are graduates of acting schools and already work in the field. While some are Ashkenazim interested in learning about their heritage, several come from completely different backgrounds and are enchanted by the beauty and richness of Yiddish culture. The program involves studying Yiddish at Bar-Ilan University or Shalom Aleichem House and putting what they learn into practice on the stage. The interns benefit from interaction with Yiddishpiel’s veteran members and tutorials from Atzmon’s wife Henya on how to express themselves in Yiddish. One of the most famous examples of Israelis’ growing openness to Yiddish is the Atzmons’ daughter Anat. After playing the quintessential sabra in countless movies and television programs in Hebrew, she has returned to her roots and now performs frequently with Yiddishpiel. They may be few in number, but some young Israelis are taking the study of Yiddish language and culture seriously. Shoshana Dominsky teaches Yiddish at the Ironi Aleph public high school in Tel Aviv. “About 80 pupils are studying Yiddish and preparing to take a matriculation exam in it. They know their grandparents spoke it and want to learn it,” she says. The program includes staging plays and writing songs in Yiddish. The school also operates a website in Hebrew and Yiddish with information for students of Yiddish, such as a Hebrew-Yiddish dictionary. “It is the only high school in Israel with such an extensive Yiddish program,” Dominsky says, adding that she doesn’t think that pupils select the school to study Yiddish, but they get excited about it once they are there. Galay’s son Assaf heads Ashkenazim, a national group of people in their twenties, most of whom are students, interested in preserving the cultural heritage of European Jews. It’s a very rich culture that wasn’t appreciated for a long time in Israel and they want to change that. The full article appeared in ERETZ Magazine 106. 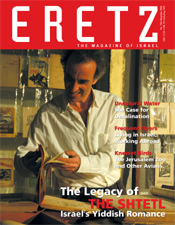 To read it, subscribe to ERETZ Magazine. 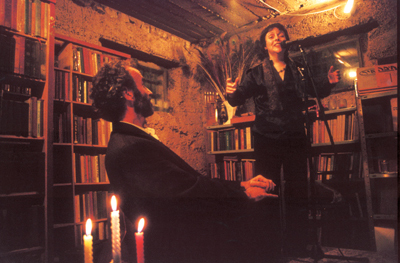 Leyvik House hosts concerts, discussions, and lectures on a variety of topics in its charming, old-fashioned hall.